"Foodies, the wait is over!" is Brooklyn Borough President Marty Markowitz's annual call to Dine In Brooklyn. From 15-25 March 2010, over 200 eateries in the borough of Kings will offer three-course meals for $20.10 at lunch and $25 at dinner (excluding taxes, beverages, and gratuities). You say you want more? Nearly 40 restaurants will offer two meals at the aforementioned fixed prices. When last I dined at this Bay Ridge bistro, it was called Provence en Boîte. Although owners Jean-Jacques and Leslie Bernat have since packed up and relocated their Provençal "box" to Boerum Hill, this space retained its Gallic flavor when Jerome Vidy reopened it as Saint Germain in August, 2004. (The name, incidentally, comes from the Left Bank district in Paris around the quartier latin, or Latin quarter—an historic area known for its literary and artistic life.) I've wanted to try the Third Avenue namesake of Saint-Germain-des-Prés for some time, but have always considered the prices un peu cher. This spring's Dine-In Brooklyn, however, afforded me an affordable occasion to sample their cuisine. The special prix-fixe menu (please see below) comprised four starters, four main courses, and seemingly countless desserts. It offered a well-chosen selection, mostly from the regular menu. The unaccustomed generosity of the promotional portions came as quite a pleasant (and satisfying) surprise. My Kir Royale apéritif set the tone for the first course. Its rosy effervescence made a delightful partner to the smoked salmon platter. 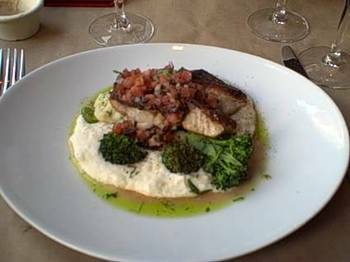 The sparkling wine, combined with the sweet influences of the cassis, complemented the rich smokiness of the fish as well as the piquancy of the caper garnish. Generously portioned and served with toast and lettuce, this was a marvelous starter. Interestingly, the salmon platter does not appear on the regular menu, though it probably should. Onward to the main course. Since I had a hankering for meat, I chose the Flank Steak au Poivre with pommes frites. Popular in French kitchens, this cut comes from a part of the cow that normally receives considerable exercise. While quite lean, the flank can be somewhat tough and stringy. Thus, it requires rapid cooking on high heat. As for my steak, it was slightly tough (predictably), but very flavorful, and cooked almost perfectly. I say almost because it was not quite so rare as I'd requested—a minor point, overall. The peppercorn sauce (made with green peppercorns, brandy, and cream) was consistent with my expectations: not great, but not bad, either. It could have benefited from additional brandy. The crisp pommes frites were authentic and very good, indeed. Why can't all french fries be made from real potatoes? Again, the ample portion's scale was more American than it was French. Among my Dine-In Brooklyn meals so far, this one has represented the best value. Considering that the regular dinner menu lists steak au poivre at $21.95 and desserts at $6 apiece, the $23 fixed price for my three courses was a bargain. Overall, my dinner was quite satisfactory despite the disappointing apricot amandine. While the bistro fare at Saint Germain is unlikely to win awards for creativity, it is fairly reliable and tasty. "Foodies, the wait is over!" proclaims Marty Markowitz, Brooklyn Borough President. This weekend, the protracted NYC Restaurant Week™ (begun mid-January) passes the torch to Dine-In Brooklyn 2009. From 23 March through 2 April, over 200 Brooklyn eateries will offer three-course lunches or dinners for $23 (excluding taxes, beverages, and gratuities). In addition, some 20 restaurants will serve two meals at the aforementioned fixed price. That's one of the best dining bargains anywhere. A couple of New England cities kick off their respective food fests today. Restaurant Week beckons visitors to savor the flavors of Newport, Rhode Island and New Haven, Connecticut. With roughly 35 Newport-area restaurants participating, this is by far the larger affair. Three-course meals are fixed-priced at $16 for lunch and $30 for dinner (excluding taxes, beverages, and gratuities). In addition, numerous events—including wine tastings, cooking demonstrations, and even a martini contest!—are scheduled throughout the week. This is the city's first such celebration in its 370-year history. From now until Friday, 18 downtown restaurants offer three-course menus, fixed-priced at $16.38 (the year New Haven was founded) for lunch and $29 for dinner (excluding taxes, beverages, and gratuities). 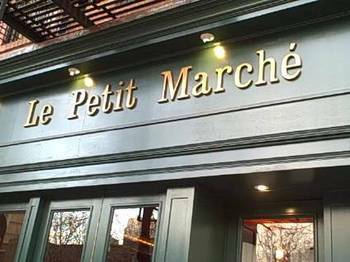 The recent Dine In Brooklyn week afforded me the perfect occasion to try Le Petit Marché, a relative newcomer to North Brooklyn Heights—an area where only the strong survive. 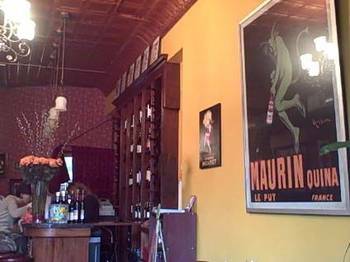 Nearly a year-and-a half old, this little Gallic bistro is the sort of place that allows me to boast that, for the money, Brooklyn offers better dining than does Manhattan. Chef Mick Pirnick produces sumptuous dishes with flavors that harmonize on the palate. 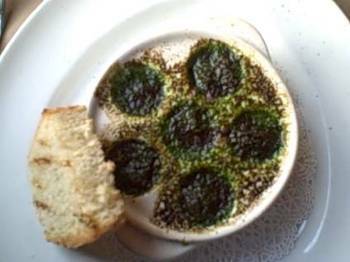 My starter of escargot broiled with garlic herb butter was garlicky, nicely seasoned (though a little salty), fresh, and quintessentially French. Call me a traditionalist, but this classic preparation, served with a slice of toast, is preferable to more recent en croûte variations I've had. 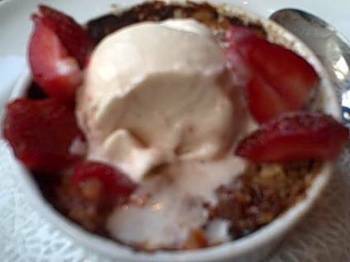 Last, I was torn between the Tahitian vanilla crème brûlée and the warm strawberry rhubarb crisp à la mode—I chose the latter. (All right, I’m not always a traditionalist.) Unlike most desserts of this sort, this one was not overly sweet and, equally important, served as a much-needed reminder of spring's arrival. Le Petit Marché is a pleasant addition to this end of Henry Street. 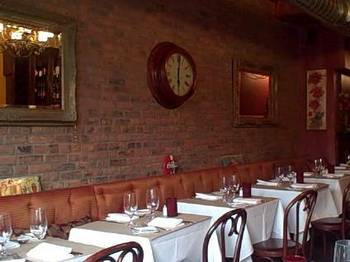 The tastefully decorated dining room with its exposed brick walls and tin ceiling befits the neighborhood. The welcoming husband-and-wife team of Daniella Silone and Igor Tsan offer their essential personal touch; the service is professional and courteous. One can really sense that they strive to please. This one’s a keeper. 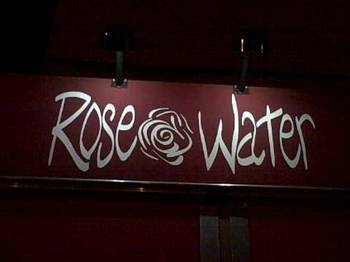 My first visit to Rose Water came several years ago, shortly after it opened. Union Street had been torn up, and thus encumbered both vehicular and pedestrian traffic. Dust, noise, and other unpleasant side effects of construction seemed to foster an inauspicious start. Nevertheless, this Park Slope "Seasonal American" eatery overcame the early obstacles and went on to flourish. I went back recently during Dine In Brooklyn week. 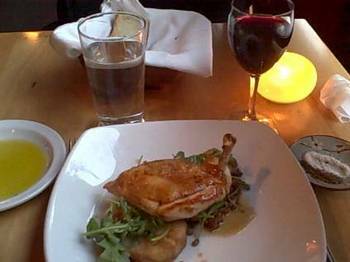 Although chicken is not usually my first choice when I dine out, it's my favorite dish here. 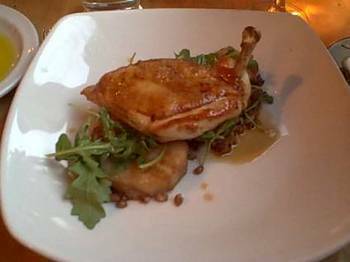 The roasted bird is one of the most popular items on the menu with good reason. But I'm getting ahead of myself. The Dine In Brooklyn menu consisted of three courses for $23. 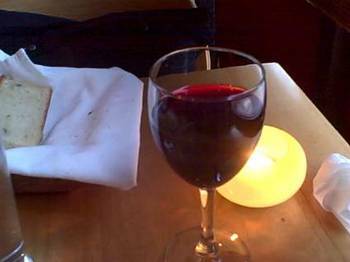 There was also an option to pair each course with a small glass of wine for an additional $14. Though I usually rely on my instincts, it's not bad to pull my head out of the sand occasionally to try wine pairings I'd not have chosen myself. 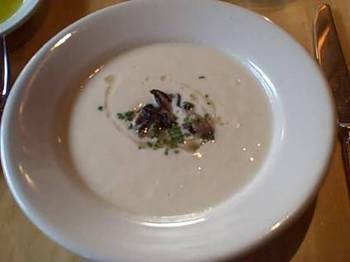 I began my meal with a delicious, creamy cauliflower soup. Nicely seasoned, though perhaps a bit too subtly, this rich potage seemed worthy of the calories. A South Fork Chardonnay accompanied this course. Perhaps I'm not quite ready for ABC (Anything But Chardonnay) club membership yet, since the pairing wasn’t all that bad in my opinion. 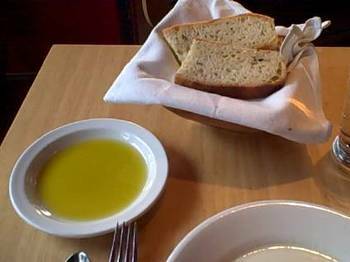 A restaurant always receives extra credit for good bread, and more points yet for serving it with olive oil, as they do here. The bread is rather good, with a firm, spongy texture. The oil is also well-chosen. Had the bread been a bit crustier, however, it could have received a few more Brownie points. On to the main course. Did I mention that I like Rose Water's roasted chicken? It's tender and succulent. Unaggressive seasoning allows the bird's natural flavors to come forward. The food-friendly Dolcetto d'Alba was a well-chosen accompaniment to this dish. Should you be unfamiliar with this wine, don't allow the name Dolcetto to suggest sweetness. In fact, it's rather light and dry, having low acidity but some pronounced tannins. I've always found its pairing with roasted chicken to be harmonious. For dessert, I chose the caramelized brioche. It was just a bit too sweet for my taste, but then, my threshold for sugary confection is lower than most people's. A misnamed "PX Sherry" was paired with the final course. If you're fond of sherries, you’ll recall that PX (Pedro Ximénez) is often used to sweeten dry ones. By itself, however, it's dark brown, syrupy, and very sweet. What I was served looked more like a White Zinfandel (fortunately the similarity ended there) and tasted like a sweetened sherry. It’s not something I'd have chosen—a real PX or Cream sherry would have been better—but it was interesting all the same. But please don’t call it PX. Beyond Dine In Brooklyn week, Rose Water offers several prix fixe options: a three-course market menu Monday through Thursday for $28; a five-course Chef's tasting menu daily for $54; and a weekend brunch for $12.50.